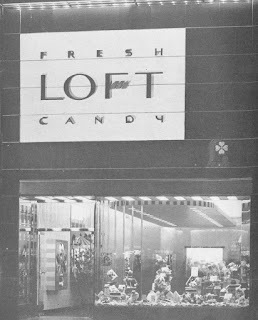 In writing two weeks ago on the discovery of a long-entombed Loft's Candy storefront down on Nassau Street, I described the sign as using the chain's "midcentury logotype." By sheer coincidence, while thumbing through a musty backissue of Interiors magazine up at Avery Library the other day, I stumbled upon the origin of said logotype, which belonged to a comprehensive rebranding that encompassed everything from the company's packaging to its delivery trucks to - yes - its storefronts. The Loft's logo unearthed on Nassau Street can be credited to a now largely forgotten industrial designer called Charles C.S. Dean. Dean is obscure today, but pulled quite a bit of weight in his day. Interiors featured his work for Loft's in its November 1945 issue under the headline "Old Candy Chain Modernizes." Started in lower Manhattan back in 1860, Loft's was going full tilt after WWII, with stores at 175 locations. Dean's new design for the company's standard storefronts called for facades of "Rembrandt blue Carrara glass" divided by horizontal strips of stainless steel. 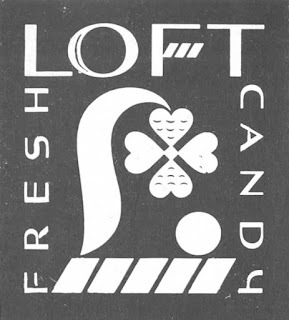 The slanty crosspiece of the logo's stylized letter "F" evoked candy stripes. The storefront design evolved somewhat by the time of the Loft's facade at 88 Nassau, but the basic pattern remains easily recognizable there today. 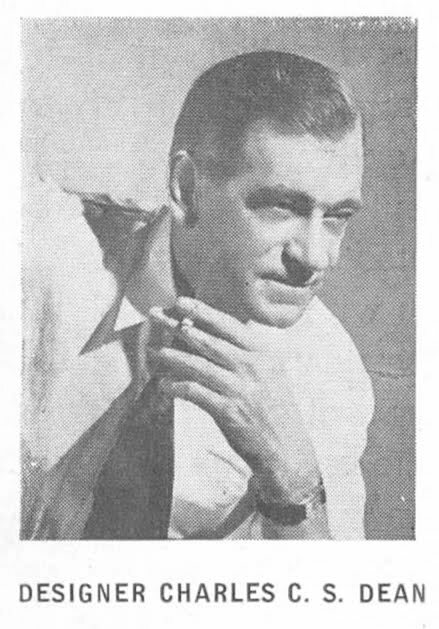 Of Mr. Dean, from Modernism101.com we learn the following: "Charles C. S. Dean emigrated to the US in 1925. ... In Chicago he worked for Kuppenheimers, designing packaging and other materials. He relocated to New York and studied at the Art Student's League and the American and National Academies of Design. After a year studying in Europe he returned to New York and worked for Newell-Emmett advertising and spent evenings studying at NYU and the Beaux Arts School of Design. He designed trademarks, brochures, packaging and booklets." Dean appears to have left no design patents for us to gauge his body of work by, but his logo for Loft's can still be found in the annals the US Patent and Tradmarks Office, where it was filed in April 1946 - and, for now, it can still be admired down on Nassau Street. Whether it will stay around for us to keep admiring it is up to Two Boots Pizza, who will open in the space in the coming months. NEON WALKING TOUR THIS WEEK! What better way to fortify yourself for Wednesday night's Presidential Debate than by marinating in the bohemian neon glow of Greenwich Village? The tour will start at 7:30 and wrap up about an hour later so that those of us with the strength for another debate can get to our respective viewing locations. Tickets are available here - hope you can make it! Next tour will be on Wednesday, November 16. Tickets for that tour are avilable at the same link.